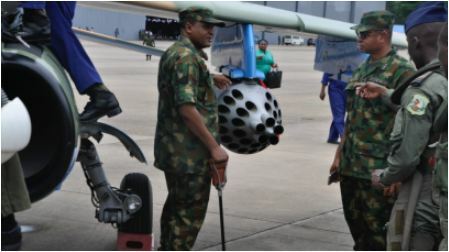 Nigerian Air Force will soon deploy fighter gets, helicopter gunships and other military assets to curb current security challenges in Benue and Taraba states, Chief of Air Staff (CAS) Air Marshall Sadique Abubakar, said. He made the disclosure at the inauguration of accommodation quarters and reference hospital for officers of 115 Special Operations Group (SOG) on Wednesday in Port Harcourt. He said the deployment of military assets was aimed at complementing joint intervention force already in Benue and in other troubled states. He added that “we are doing a whole lot to make sure that every community in Nigeria is secure. Part of that commitment is our recent establishment of Quick Response Wing in Taraba. “The unit will soon be deployed to Uguruoje community in the heart of Taraba. The establishment of the unit will add value to what is happening and secure communities. “In Benue, we already have a joint intervention force comprising army, navy and air force with over 1,000 personnel reporting there. “Some of the aircraft in 115 SOG will be mobilised to different areas of the country where they are required. So, everybody is working round the clock to secure the communities.” The chief of air staff said Federal Government and the military were committed to addressing current security challenges in the middle belt and in other parts of the country. He added that air force had on Monday taken delivery of two M1-35M helicopter gunships acquired from Russia as part of ongoing efforts to equip troops. The air chief said aside equipping troops, several efforts were made to improve welfare of troops and professionalise the air force. “Professionalism is not just acquisition of aircraft and getting people to fire rockets and bombs. The whole aim is equally to take care of the human beings. “This is why we embarked on providing officers’ accommodation building to assist in addressing the accommodation needs of this unit (115 SOG) to a large extent.